Our experienced function team and resident DJ will ensure your party at Whitewater Hotel is a night to remember. Arrive to a welcome drink & nibbles at 7pm for 7.30pm sit down before enjoying a four course festive menu with party trimmings followed by a disco. Inclusive of festive menu and party trimmings. Dining rooms available for private dining prior to joining the disco (subject to availability and room hire). 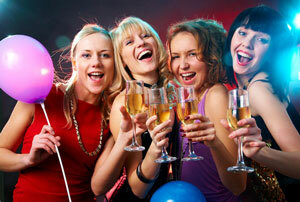 Please call 01539 531133 to book your party and to ensure you get the date you really want! Click here to view / download our Christmas Party leaflet. Provisional bookings will be held for fourteen days, pending the appropriate non-refundable deposit. Full payment of the remaining balance is required with final numbers 28 days prior to the party date. Any alterations after this date cannot be guaranteed and will not be refunded if numbers reduce. Food and wine pre order with the table plan is required no later than 21 days prior to the event.